Killer Characters: Do You Think He Likes Me? Hey there, nice to meet you! I’m Tiffany! What do you think of my new outfit? No, it’s not a skirt, silly. It’s a skort! More specifically, it's a yoga skort. I’m here at Some Like It Hot Yoga with Kate Davidson, the yoga teacher/sleuth in A Fatal Twist. Kate and I aren’t friends, exactly. In fact, I don’t think she likes me all that much. I didn’t like her either, but she did me a solid a few months ago. If she’d pressed charges when she caught me breaking into her car, I’d have gone back to jail for sure! Sure, I’ve been her slave ever since, but I don’t mind helping her out at the yoga studio. It gives me an excuse to buy a whole new wardrobe. Who knew yoga clothes were so stylin’! Anyway, I owed her one. So when Kate asked me to pretend to be her life partner while she went undercover as a patient at a fertility clinic, how could I say no? OK, you caught me. The “two girls searching for a sperm donor” ruse wasn’t Kate’s idea; it was mine. But in my defense, I didn’t have much trouble convincing her to play along. I had no idea we’d end up taking a hot yoga class as part of the charade. Luckily, I was already dressed for the occasion. Kate on the other hand … Well let’s just say she's dressed more like a nun than a fitness buff. I’ve never actually tried yoga before, but how hard can it be? Kate teaches it, after all, and she’s ancient. She might even be pushing thirty-five. Sorry, I can’t talk anymore. Class is about to start. The instructor just put on his headset. Kate calls him Adonis. I don’t know what that means, but I have a feeling she’s being sarcastic. Believe me, he’s gorgeous. He fills out those tiny yoga shorts in all the right places, if you know what I mean. I hear he’s going to teach some partner yoga poses today. Kate (the old prude) isn’t going to like that at all. In fact, there she is, glaring at me from the back of the room. I can practically smell her from here. Who would have thought one woman could sweat that much? Ooh—Adonis is looking at me. He smiled! Do you think he likes me? 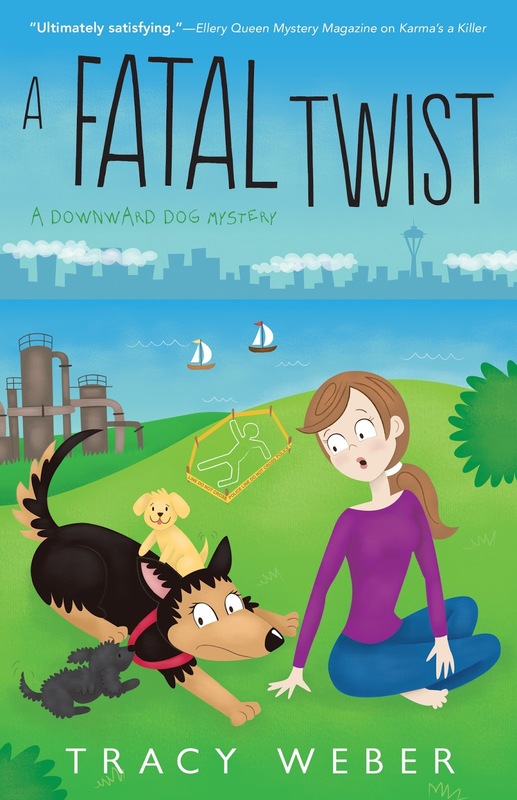 To find out how Tiffany and Kate’s yoga adventure turns out, check out A FATAL TWIST. 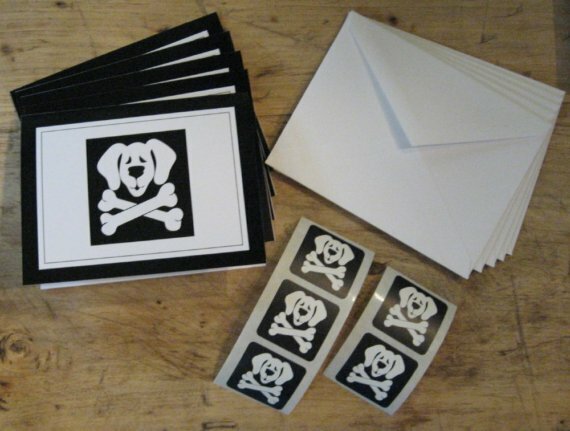 In the meantime, leave a comment describing a crazy thing you did with a friend for a chance to win a set of dog and crossbones note cards! Winner selected April 17! Hi all! Tiffany here, dying to hear about all of your friend adventures. What's the craziest thing you did with a friend? Tracy here--I got kidnapped on my 16th birthday, too. Though I don't think I did anything quite that fun. Tracy again. Oh my! Once when I was moving, I did the same thing. The mattress didn't fly off--it folded in half like a napkin! One late night my best friend and I snuck onto the golf course to run around the greens. We had a blast rolling down the hills, looking up at the stars, climbing the trees, dancing barefoot. It was all fun and games till the sprinklers came on. How old were you? Sounds like a fun adventure. My friend and I went to a bar, left at closing time, then went to her ex-boyfriend's house. He was living with his parents at the time, and we woke them all up. It didn't go over too well, but we had a good time. Thank you for this chance. Did she and the ex get back together? She threw you under the bus! 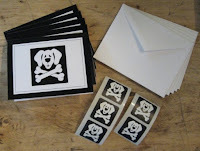 The winner of the dog and crossbones notecard set is Robin! Robin, please contact me at Tracy@WholeLifeYoga.com with your mailing address and I'll get them in the mail to you!